Seems like it will work well for a variety of loads by just adjusting load column hight. It may take some die adjustments on loads where column hight is not variable. I'm hoping to get this to work with the Svarog Italian slug. This slug has a meplat to collar length of .345"
I guess I will have some playing around to do when and if I get this press. If the slugger starts it's fold in the same spot as a star crimp starts it will be almost perfect for the load hight I have. Ranch Dog got any pics of those dies when you had them apart? Just these. Really, not much to them. Got around to shooting the Lee one ounce slugs that were loaded with the Slugger. A majority of these were a bit rough as I was adjusting the dies. The bottom line is that they shot so good that I need to work back through them using the Slugger. 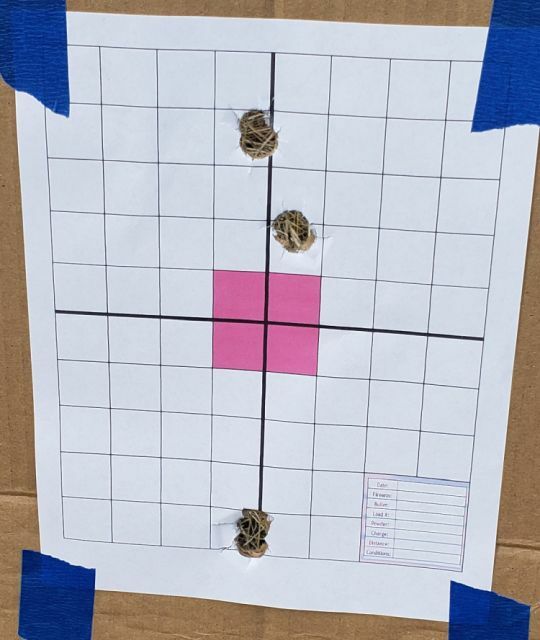 I shot a 5½" group with these "seconds" at 100-yards. Nothing weird about the group, no fliers, plus the wind across the range was gusting from 5 to 20 mph. So, maybe there is something to this rolled fold. The picture of the ammo is a couple of posts above. Cheddite 2¾" primed hull trimmed to 2.740"
When I shot these wads with at six-star folded crimp, they did not survive the trip down the barrel. The petals were completely worn off. No so with the MEC's rolled flood. Despite the gusting crosswind, all the pressure wads were dumped about 35-yards down range in a very tight elongated oval (wind), all of the petals intact and showing very positive groove contact. I will be in the nearest city this week and hope to find some other powders to try. I would like to add Blue Dot and Steel if I can find it. 5" is as good or better than I've ever seen with the lee 1 oz. Big hat tip! Also, for grins, I had loaded some of the NOE Lyman clone (690-500-HB) with the MEC Slugger using some once fired Remington low base dove hulls. The NOEs where seated in Claybuster CB113812 pressure wads (WAA12R clones). So two clones that are a great fit for each other. I didn't fill the base of the slug; this was just about seeing how the Slugger handled another setup without any die adjustment. I've worked with these hulls for a bit, and they don't lend themselves to reloads as the eight-star crimp cuts the thin plastic. 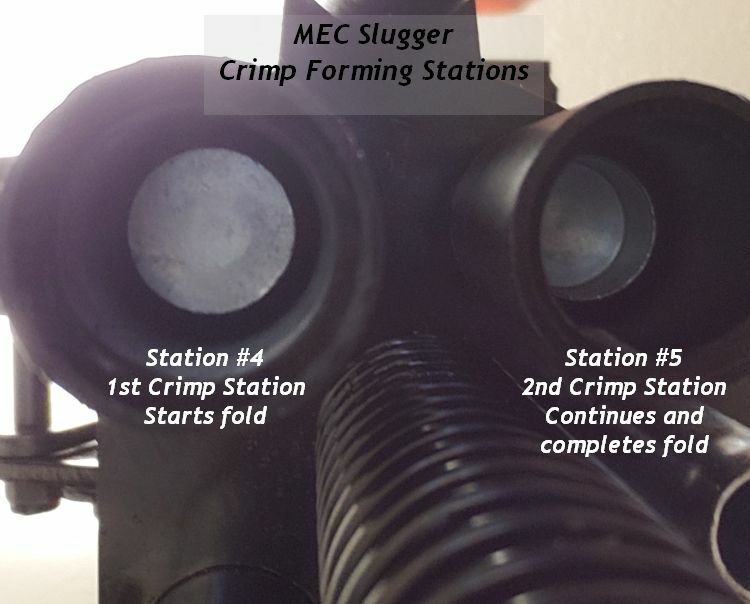 The first through the Sluggers crimping stations is on the far left, the lip of the hull had not been folded down enough to reach the edge of the wad, but about a ⅛" cam adjustment "up slot," closed that gap. The hulls on the right, are the same as those on the left, nice and ironed out. As a note, I had shot these hulls with a roll crimp, and they all had to be discarded as they were split at each of the segments of the star. I suspect the heat/friction had made the segments too thin. I shot these out of my New Haven 600, another clone, with a 24" rifled barrel with open sights. I had waited until the wind went still in the evening and then pulled the trigger on the loaded hulls sending six of them down range 50 yards. Probably not impressive to you, but to me, it is as my eyes cannot see the rear sight, not at all. It is just a fuzzy block on my end of the barrel. I lowered the front sight, which I can see fine until it drops into the fuzz. So I got three spots where two slugs went through the same holes. That is some kind of weird. I didn't think about it, but I have the Williams dovetailed WGRS on several scout rifles. 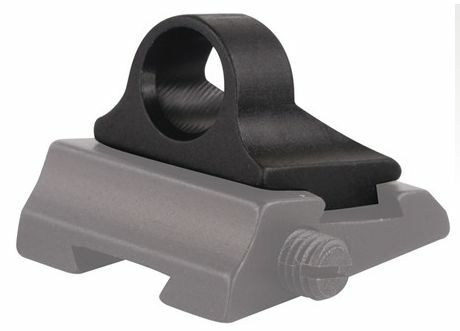 I'm going to remove one today; it should slide right in the dovetail the rear sight occupies. I had not filled the base on the NOE 680-500, and the wads were gone, eaten up. But they must have lasted long enough to get the slug out of the barrel and spinning to keep them on centerline at 50-yards. Notice that not only are the petals gone, but so is the powder cup. I did pick up all six of the spent wads; they were identical. I don't think that I will bother filling the base whenever I come back to this slug design as I don't think solves the wad issue. My problem with the design is the thin front band. My belief is that wad problems start as soon as the pressure wad hits the forcing cone. 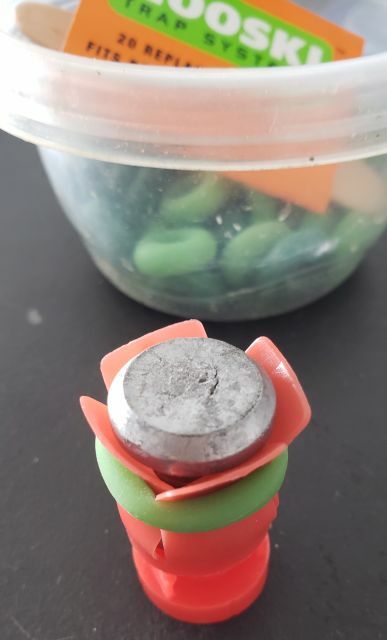 I believe that the petals, off of any wad, slip off front band and collapse into the the shutllecock's immediate diameter reduction. I pondered this a bit and figured I could demonstrate it with a mouse trap. Sure enough it did. As the wad hits the forcing cone, there is no way petals are going to stay with the thin front band. I think if you are going to fill the base, you need to fill the airspace between the front and rear bands. 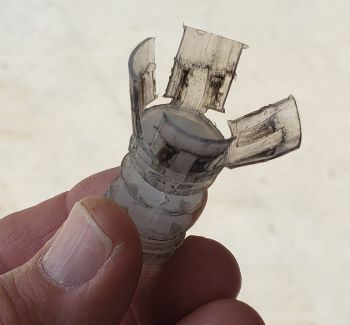 Maybe to 3D printed halves taped together like the Lightfield use. I will change the rear sight and give some more a try in the next couple of weeks. Oh, almost forgot! Nooski makes an awesome mouse and rat trap. Not only does it "noose" them it knocks them out of the trap so their running mates don't smell dead vermin in the trap. If you have these fellows, you can get them all in short order as they will keep entering the trap. Interesting theory, ranchdog! 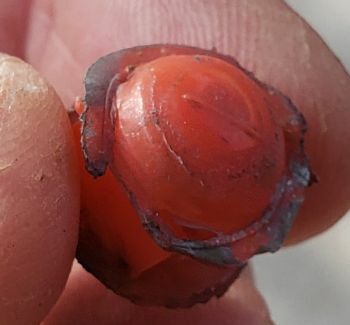 An easy proof of concept might be to fill the space between the "waist" of the slug and the wad with some kind of granulated buffer or even lube. Anything to provide support for the wad petals might help the wads stay intact the whole trip down the barrel. Rd you are wrong about filling the slug base , especially with those soft wads. Try it using hot glue, overfill then trim. Your photo tells the story perfectly regardless of what happens to the petals. I would suggest at least one card under the slug as well to raise it to the top of the wad. Then it would be perfect for a thin overshot card (the BPI frangible clear plastic disc are terrific for this). It appears that you could just fold crimp with the height of that wad to obtain a more consistent crimp fro pressure purposes. Nice windage on all those shots, I get the vision scenario!